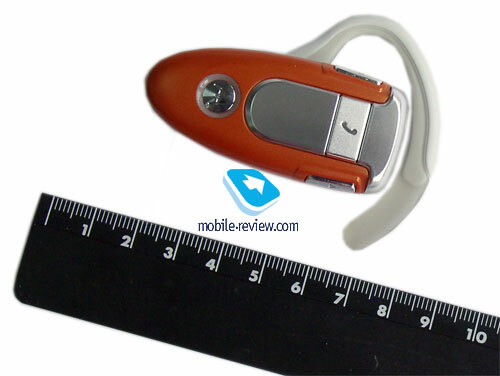 Motorola H500 is a Bluetooth-headset materialized only owing to the PEBL U6. 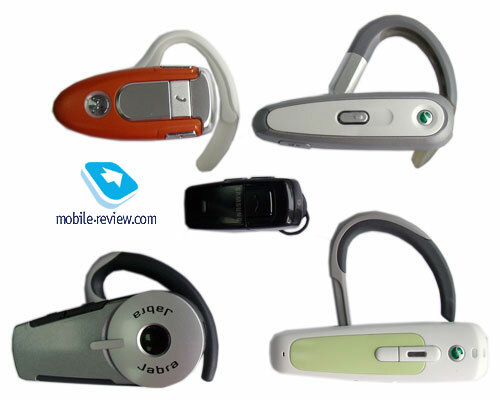 Frankly speaking, several manufacturers have already put special accessories announcements for certain models in practice; Sony Ericsson with its brand-new gadgets for Walkman series, Nokia’s HS-12W headset for the 8800 (review on the HS-12W is coming up) and so on. As regards the unit featured in this article, it’s a fashion device meant for routine activities, i.e. usage in office, car etc. When I got my hands on the H500 for the first time, I looked through the press-file and the company’s official page and found out that both are claiming that the H500 perfectly fits VoIP communication purposes. In some ways it’s a smart marketing move, since almost any Bluetooth-headset will do for talking via Skype (what really does matter here is compatibility of your headset and PC’s hardware) – actually this slogan inclines people unaware of such capabilities, but looking for extra advantages towards purchasing this very product. Since the H500 and the PEBL were initially meant to be complementary products, design-wise these devices look pretty much resembling. Subjectively, the headset retains “smooth” curves, though I don’t think this word does for writing, but it’s the first feeling flashing in your mind after playing around with the headset for some time. The H500 completely lacks any sharp corners, saving for the volume control keys, but on the whole tactile feelings are mostly favorable, all details are well-tuned and feature nearly flawless shapes. 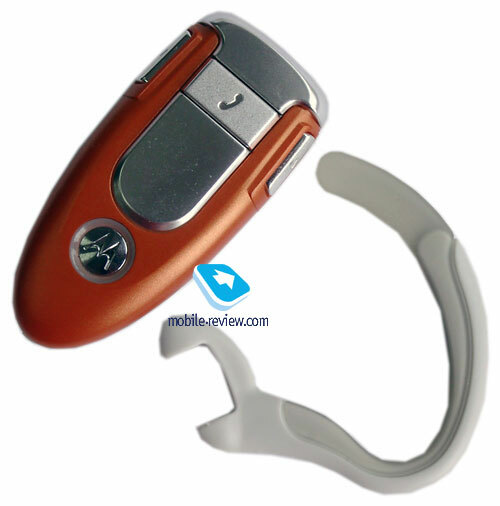 In terms of design, this model claims the title of an eye-picker – generally speaking all latest Bluetooth-headsets made by Motorola show off pretty original and sticking looks, which can be hardly confused with models by other manufacturers. And, naturally, the appearance of the H500 goes well with Motorola’s phones like RAZR, PEBL, SLVR and recently announced slim solutions. One of the best things about the H500 is variety of trims it comes in – 13 types of finishing, therefore both men and women will find fitting color schemes for any occasion. In my opinion the Soft Touch Black will be chosen by majority of men, while the Hot Pink will be picked mostly by women. At any rate, all used colors have been aimed at blending with the PEBL’s trims, so that you could buy a headset of the same color; however that doesn’t mean the H500 won’t look good with handsets by other manufacturers (the first model I can think of is Samsung E530). 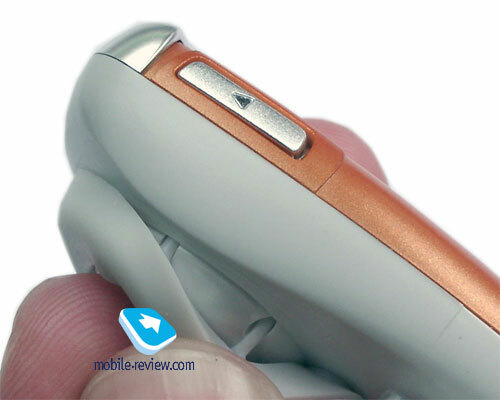 The headset’s construction appears rather ordinary – a bar-looking casing with a reversible earhook. The developers have applied high-grade plastic, thus you won’t have the toy feeling when holding the H500. Both building and painting qualities are fine – unwanted gaps are missing here. Another thing of note is the rear unpainted part, featuring a soft rubber pad exactly in the place where the headset touches your ear. It’s also worth mentioning that the panel housing the multi-function button is a real fingerprint magnet, getting soiled in no time, though it can be easily wiped up. The earhook is quite good as well – its rear and bottom parts are made of soft rubber, so combined with the pad on the speaker they make the H500 feel really great. In day-to-day activities the headset performed well – it didn’t fall down even on jerking movements and seemed ergonomically handy. The only gripe of mine was the very first presentiment that the headset was about to drop down and would do so should I turn my head. But thankfully it has turned out to be almost impossible for the H500 to fall off. For managing the H500 there are three buttons on the headset’s casing – the front one is a multi-function key standing for pick/hang up, switching pairing mode on, dialing last used number etc. The sides feature volume control keys – whichever ear you’re wearing the headset on, the upper key will always increase volume. At first glance it might seem strange, but the system is quite simple – there is a tiny ball inside the headset, which seals in depending on which key is on top. If you put some efforts into this and shake the H500 you will hear it knocking inside. On the whole the controls are relatively handy, although I have got several comments, namely the multi-function button could have been bigger; the volume keys are mostly fine, however I would prefer having better feedback and hearing clicks when I press them. The headset is powered by a 180 mAh capable Li-Ion battery, featuring up to 200 hours of standby time and nearly 8 hours of talk time – at least these are official numbers. And judging by the announced lifetime, the H500 is seemingly the most long-lasting accessory by Motorola. Apparently, maybe this is the reason why the H500 is advised for VoIP calls (once again, keep in mind that it’s pure marketing tricks). In our test the headset remained good for three-four days on heavy load (1 hours of H500-powered calls per day), or a little bit more – it’s quite good lifetime for a headset coming from that price-bracket. The H500 is armed with a miniUSB connector, which ensures full-scale compatibility with chargers of RAZR V3, V3i, V3x, SLVR L7, PEBL U6 etc., what is more, it makes possible to charge it via miniUSB-USB cable plugged in a PC or a notebook. It takes around 1 hour to charge the headset from empty to full using standard charger and nearly 2 hours to do the same but via a USB cable connected to a PC. We carried out all tests on three handsets – Nokia 9500, Nokia N80, Sony Ericsson W900. In the end we didn’t manage to figure out any shortcomings with the H500 – the devices got paired up correctly, autopairing didn’t cause any problems either; neither did last number dialing, switching between calls and voice dialing functions (though Nokia 9500 couldn’t handle the last one). 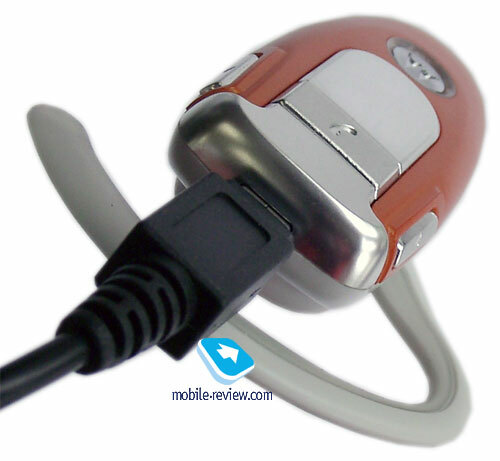 As for the sound quality, regrettably, the H500 deserves nothing but a satisfactory mark – in this field it yields to several gadgets residing in the same category, for example Sony Ericsson PV-700. Having gotten out of the recommended range (10 meters), you will surely notice that your words have become almost impossible to discern, although the voice of the interlocutor is still rather clear. No doubt when the phone is at hand such problems are non-existent, nevertheless on rare occasions people on the other end told me that my voice is somewhat quiet and asked me to speak out. Similarly to the recently reviewed Motorola H700, a built-in DSP-processor is missing on the H500 with all the ensuing consequences – it’s better to use it in a more or less quite rooms, or when driving a car with windows being shut. 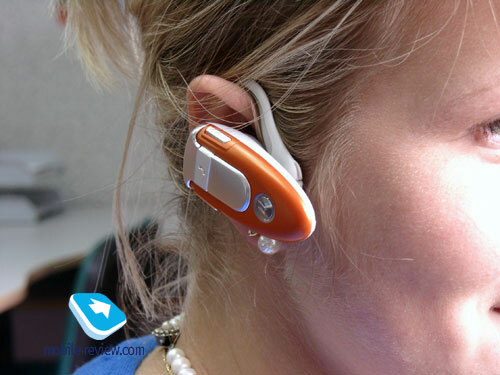 Bluetooth-headset Motorola H500 is a quite fetching model that is a really good buy – it will suit both drives and office workers regardless of gender, thankfully there are loads of color schemes to choose from. Speaking about the design, I have to admit that it’s a top-notch one; the H500 may be even called a fashion headset allowing its owners to make a wow-effect, at that the lifetime of the H500 deserves best reports. But who will find it unfitting? Obviously, people looking for more austere design and amplified sound quality. The price for Motorola H500 is quite vague, since it’s possible to buy to for 45 USD, while other vendors will offer it at the price of 80 USD (apparently, the latter case is not an option – for this money you can buy a more feature-packed headset). The only thing forcing us to mention this point is oddity of the situation; we can only propose various theories explaining that. But subjectively, the H500 should cost around 40-43 USD and in my opinion several companies are just boosting the price for “uncommon” trims. It seems the RAZR’s story is going to recur – there were times when solutions in colors other than the default silver were considerably overpriced. Looking into the list of the H500’s probable rivals, I can rightfully say that they are few. Taking into account major attractions of this headset like appealing design, variety of trims, Bluetooth profile, splendid lifetime and price range from 40 to 45 USD, we’ll see that only the following competitor left: Sony Ericsson HBH-PV700, offering better sound quality, but at the same time only two custom color schemes and worse lifetime; Jabra BT160 with its 33 exchangeable panels and fairly good lifetime, however in terms of building quality it’s inferior to the H500. And as regards Motorola’s own line-up, the H500 is a kind of separator, dividing the product line into “low-end” (HS805, HS815, HS820, H300 и H350) and “high-end” (H700, H605, H3 и т.д.). 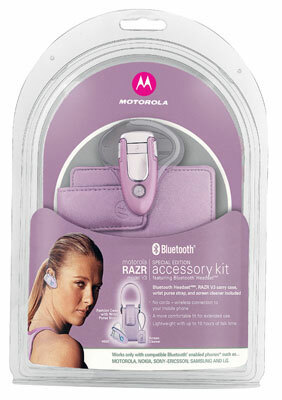 By the way, Motorola currently proposes quite appealing kits, which feature the H500 –Internet Calling Kit (H500, adapter PC850) and RAZR Fashion Bundle (H500, a carrying case for RAZR, display cleaner, everything in pink). – 200 hours of standby time.